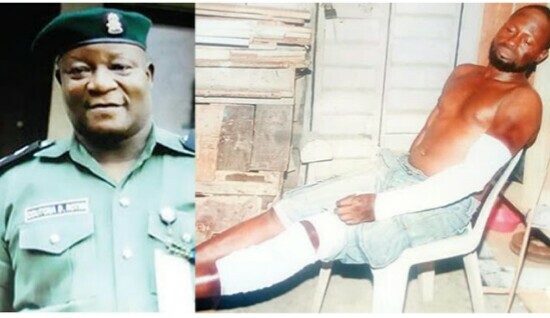 The Divisional Police Officer in charge of the Ijora-Badia Police Division, Lagos State, CSP Rotimi Odutona, has been accused of fracturing the left hand and leg of a carpenter, Saheed Akinboye, while assaulting him at the station. What led to a senior officer engaging in such reckless act? It was gathered that Akinboye, in company with Mr Rasaq Balogun and Mrs Modupe Ojediran, had gone to the station on Monday to recover six dozens of chairs that were seized during a raid by police operatives on Sunday following a clash by suspected cultists in the Ijora-Badia area of the state. It was learnt that the clash resulted in the death of a suspected cult member, simply identified as Tansho, while Akinboye, who runs a rental business as a side trade, was said to be packing the chairs he had rented out to Balogun, when the policemen confiscated the chairs. Akinboye said Odutona, who never gave him an opportunity to explain himself at the station, used a baton to beat him repeatedly till his hand and leg got fractured. The carpenter said, “I rented chairs to Balogun, whose daughter, Tawakalitu, was celebrating her freedom from a tailoring school on Sunday. The ceremony took place on Akorede Street; it was supposed to start around noon but due to the rain, the event started late and ended around 7pm. “I was packing my chairs from the venue of the ceremony when the police operatives from the Ijora-Badia Division raided the area, packed my chairs into their vehicles and took them to their station. “I quickly informed Mr Balogun about the raid and he told me to wait till the next day (Monday) so that we could go to the station together to meet with the DPO in order to retrieve the chairs. When we got to the station, we were accosted by an officer, who asked why we were there and we explained that we needed to see Odutona because of the chairs. “When the officer asked who owned the chairs, Mr Balogun and his daughter’s boss, Modupe Ojediran, said I was the owner. So, the officer took me to Odutona and told him that I was the owner of the seized chairs. “Immediately he saw me and without giving me a chance to explain what happened, he started using his baton to beat me. He beat me repeatedly; I begged him to hear me out but he never listened. He kept on beating me till my left hand and leg got fractured; after the assault, he pushed me out of the station and I landed on the floor. I lost my Tecno phone and the sum of N80,000 in the process. Akinboye, who is demanding justice for the assault on him by Odutona, said he had already spent about N25,000 on treatment and had been suffering intense agony. The Punch learnt from Balogun and Ojediran that the DPO turned down a request to meet with him to clarify issues after he allegedly assaulted Akinboye, adding that he (Odutona) drove them out of his office on the excuse that someone was killed in the area. Balogun said, “He (Odutona) never gave us a chance to explain that the man (Akinboye) that he assaulted was the one from whom I rented the chairs for my daughter’s freedom ceremony. I had received a call from Akinboye, who informed me that 30 minutes after we finished the ceremony, he was packing the chairs when police operatives raided the area, because someone had died during a fight in the area. “I and Ojediran witnessed what the DPO did to Akinboye, and when we went to his office to clarify issues, he drove us out, saying what were we looking at when hoodlums killed someone in the area. Where they killed the person was not where my daughter’s ceremony took place; he had no reason to subject that man (Akinboye) to such assault. 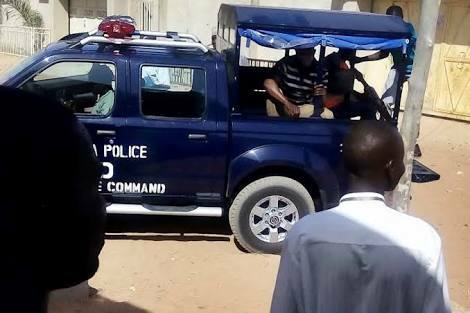 Tawakalitu’s brother, Yusuf, while condemning Odutona’s alleged action, said where the clash that led to the death of the suspected cultist took place was about 600 metres away from the venue of his sister’s freedom ceremony. The state Police Public Relations Officer, CSP Chike Oti, said Odutona had denied the allegation, but added that the state Commissioner of Police, Edgal Imohimi, had ordered a probe into the matter. Oti stated, “He (Odutona) denied the allegation, saying that was not what happened. He confirmed that the police actually raided a criminal hideout in that location and arrested a number of people, some of whom had been charged to court. He said it was strange that somebody would be making that kind of allegation against him.